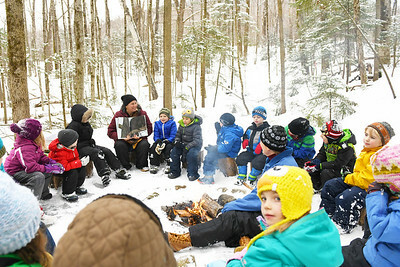 Julia Bonafine, K-2 teacher at Shrewsbury Mountain School, reads "In the Snow: Who's Been Here?" 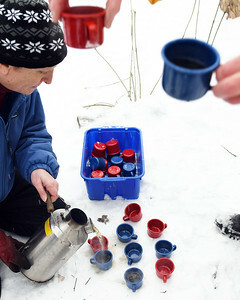 to a group of kindgergarten and first graders around a fire at their outside classroom Thursday afternoon. 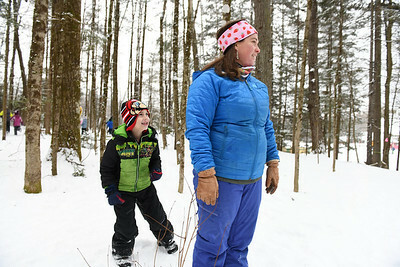 A Shrewsbury Mountain School student runs into the woods during "Sit Spot Time," in the outdoor classroom Thursday afternoon. "Sit Spot Time" is when a student finds an isolated place in the classroom and reflects internally, observes nature. Afterwards, the students meet in a circle and talk about their observations. 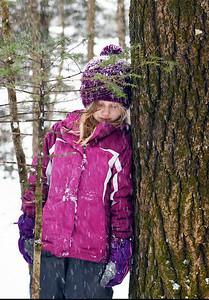 Rye Wilson, 1st grader, embraces a tree while observing during "Sit Spot Time" at the Shrewsbury Mountain School's outdoor classroom Thursday afternoon. Rye Wilson, 1st grader, embraces a tree during "Sit Spot Time" at the Shrewsbury Mountain School's outdoor classroom Thursday afternoon. 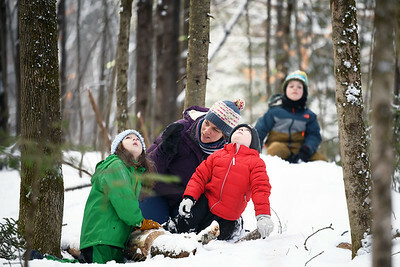 Heather Cote, center, parent volunteer with the Shrewsbury Mountain School, looks up into the trees at a woodpecker at the school's outside classroom Thursday afternoon. A student hides behind an adult while playing Run Rabbit Run, a hide and seek style game, in the outdoor classroom at the Shrewsbury Mountain School Thursday. Evelyn Morris, 1st grader, leans against a tree during a "Run Rabbit Run," a hide and seek style game at the Shrewsbury Mountain School Thursday afternoon. Julia Bonafine said the outdoor game is a favorite with the students but also with educators because the kids learn how to sit still and focus as they wait to be found. 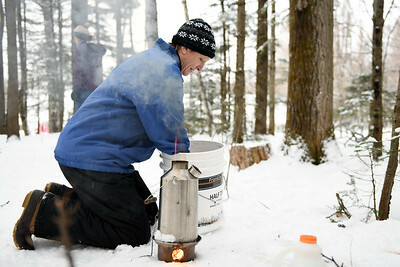 Fire tender Amy Blongy prepares a pot of lemon balm tea in the Kelly Kettle for a group of Shrewsbury Mountain School students in the outdoor classroom Thursday. 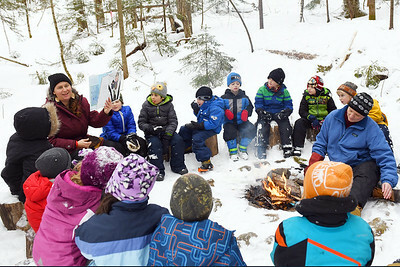 Julia Bonafine, K-2 teacher at the Shrewsbury Mountain School taps on the drum to summon the children back to the fire in the outdoor classroom Thursday afternoon. 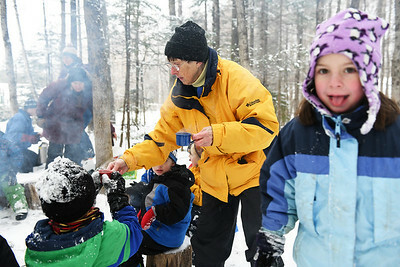 Shrewsbury Mountain School hildren are served a hot by foster granmother Amy Worcester a cup of lemon balm tea around a campfire at their Outdoor Classroom in Shrewsbury Thursday afternoon. The children grew and harvested the tea last year. 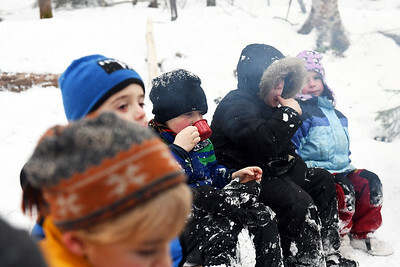 A child sips lemon balm tea in the outdoor classroom at the Shrewsbury Mountain School Thursday. The children harvested and dried the lemon balm herb themselves last year.